Small form-factor machines have emerged as a very significant chunk of the PC market. Building on the success of the UCFF NUCs, Intel introduced the mini-STX platform in 2015. We have seen multiple mSTX PCs from vendors such as ASRock (DeskMini 110), ECS (LIVA One), and MSI (Cubi 2 Plus). ASRock took things a bit further by introducing the micro-STX form factor in early 2017. Compared to the 5.4" x 5.8" mini-STX board, ASRock's micro-STX comes in at 7.4" x 5.8". The extra width (2") allows for a MXM GPU slot and two additional M.2 slots. The DeskMini Z270 was introduced last year, and the Z370 version with support for Coffee Lake was announced at CES 2018. Gaming PCs have maintained growth despite a significant slowdown in the general PC market. Small form-factor machines have also seen a lot of success. Many vendors have tried to combine the two, but space constraints and power concerns have ended up as performance-limiting factors. ASRock was an early player in this market with the NVIDIA-based Vision 3D and AMD-based Vision X mini-PCs that combined a mobile CPU and a discrete mobile GPU in a compact system. However, in the last three years, ASRock started focusing on the UCFF form-factor with the Beebox lineup. The micro-STX form-factor brings ASRock back into the SFF gaming PC market. The DeskMini Z370 systems address some of the usual complaints that users have when comparing an off-the-shelf compact gaming PC to a custom build with a mini-ITX board. 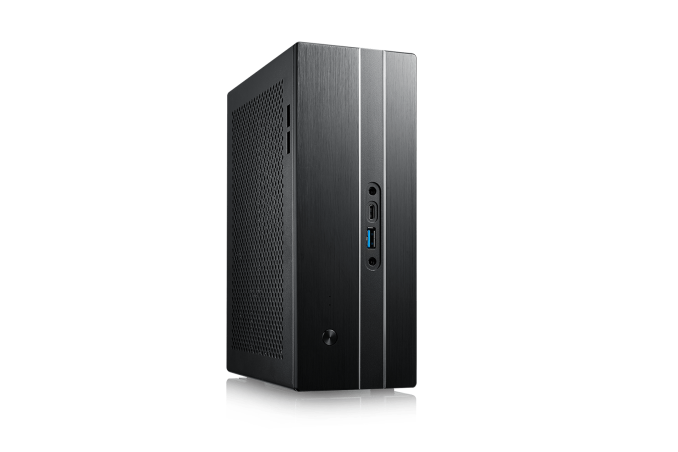 Unlike pre-built machines like the Zotac ZBOX MAGNUS series or the Intel Hades Canyon NUC, the DeskMini Z370 comes with a LGA 1151 socket, allowing the system builder to choose the CPU best suited for his/her needs. Display outputs are available from the discrete GPU as well as the integrated GPU in the LGA 1151 processor. On the flip side, the supplied chassis is utilitarian. The hardware components (the WLAN module's antennae and the SODIMMs) are somewhat difficult to install, compared to the gaming mini-PCs from other vendors. ASRock sent over the DeskMini Z370 GTX1060 with a pre-installed Intel Core i7-8700 and a GTX 1060 MXM card. The review kit also came with DDR4 SODIMMs and a M.2 NVMe SSD from the Team Group. The barebones version comes with the MXM card and the WLAN module. The CPU, SODIMMs, and the M.2 SSDs need to be sourced by the end-user to complete the build. The specifications of our ASRock DeskMini Z370 GTX1060 review configuration are summarized in the table below. The ASRock DeskMini Z370 GTX1060 kit doesn't come with any pre-installed OS, but does come with a CD and a read-only USB key containing the drivers. In any case, we ended up installing the latest drivers downloaded off ASRock's product support page. In addition to the main unit, the other components of the package include a 220 W (19V @ 11.57A) power adapter, a US power cord, the WLAN module and associated pigtail connection wires, a couple of 2.4 GHz / 5 GHz antenna for the Wi-Fi feature, a driver CD, SATA cables, user's manual and a quick-start guide. The gallery below takes us around the chassis and I/O features in the unit. The components need to be installed after sliding out the top cover. The gallery below shows the internals of the system. The BIOS of the system is a joy to use. In terms of overall appeal, th Intel VIsual BIOS is hard to beat. However, the ASRock GUI comes a close second. In terms of available features, only the NUCs have more flexibility. The BIOS allows graphical setting of the fan curves, control over the integrated graphics for enabling headless displays etc. In the table below, we have an overview of the various systems that we are comparing the ASRock DeskMini Z370 GTX1060 against. Note that they may not belong to the same market segment. The relevant configuration details of the machines are provided so that readers have an understanding of why some benchmark numbers are skewed for or against the ASRock DeskMini Z370 GTX1060 when we come to those sections. sadly the fly in the ointment for something like this is that MXM cards are still really hard to find and sold at major markups vs standard desktop cards. >The system also sports a HDMI output from the integrated GPU (which does have PAVP). However, it is restricted to 4Kp30, and is not a good fit for HTPC purposes. so you could use a separate monitor for the protected AV path for UHD blurays.